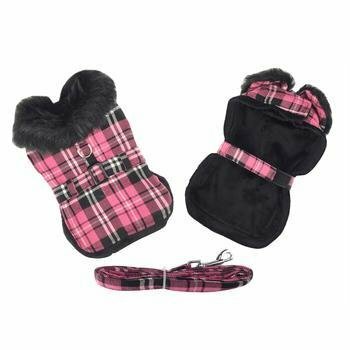 New upgraded Hot Pink Plaid with thick ultra-plush black minky fur collar harness coat. Coat features touch fastener neck and chest closures. It includes a matching leash and a D-ring for easy leash attachment. Made of high quality cotton/poly blend. We've continued the Quality with Double Box Stitch Re-enforced D-Rings attachments.